I go with a known rig because I need a fish in the net. I go with a loved bug because I want to swing a fly rod. I experiment/screw around because boots in the water is enough. This past weekend though, it was different. It started snowing in Bozeman on Friday afternoon. On Saturday morning, I headed down to the river, not quite sure how it would go. I broke trail on the dirt road to our house, snow flowing up over the hood of my car. The thermometer on my dash read 19, so upon my arrival, I pulled on two pairs of wool socks, fleece pants, two zip-ts, my biggest puffy and a thick beanie. I found an old pair of fingerless gloves in my dad's closet and tucked them into the top of my waders. I drove back down to the bridge - wearing just my left wading boot so that I could drive the car with some level of accuracy in the deep snow. When I got there, I pulled on the other boot, grabbed my net and rod and walked out onto the bridge to see what was what. The fish were active. I slid down the steep incline to the river's edge (wading boots provide minimal traction in fresh snow), and stepped into the river. My first thought was something along the lines of what the hell am I doing? The temps have been mild for the last few weeks, so the water wasn't that cold. It was snowing lightly, and I was definitely wearing enough clothes, but had no idea what I was getting myself into. I waded out toward one of my favorite holes. Two casts and a fish. Two more and another. Both rainbows. Both wearing beautiful dark winter colors. 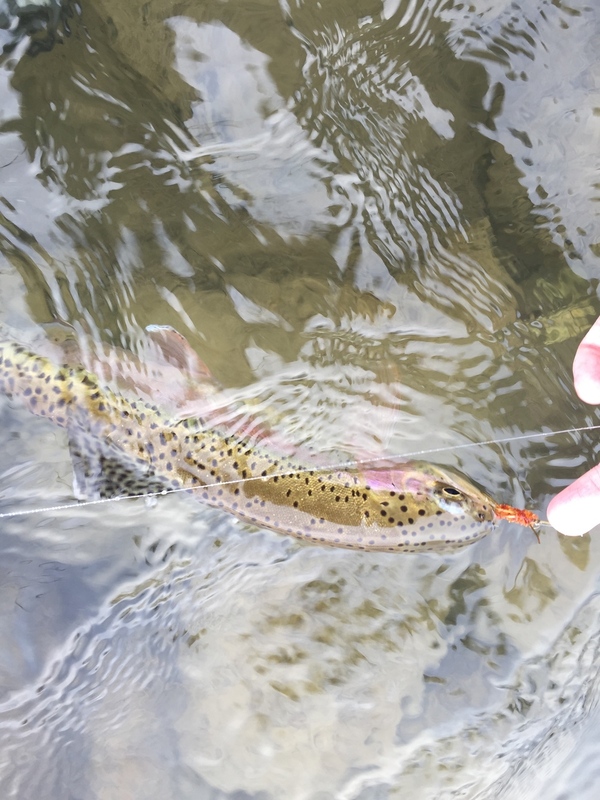 I released the second fish, careful to keep my hands out of the water, and as I watched him swim away, I realized that it was profoundly quiet. Not many people brave the elements to wet a line after a snowstorm, but it was more than that. I was quiet. I had been so consumed by taking in the experience, noticing the midges on the water, looking for any surface action, trying not to fall down, that I hadn't thought about anything else. Not even if I was going to catch a fish. It's no secret that flyfishing has the ability to do this - consume your senses and provide the angler with a welcome reprieve from the daily ticker of mundane thoughts that occupy our brains so much of the time, that the river requires a calm focus and certain situational awareness that doesn't leave room for much else - but this was different. Not eerie, but shockingly peaceful - so much so that it caught me off guard. I was so aware of that moment, that I couldn't think ahead or behind myself. I was truly in and of the present, and it was perfect. Feeling good about my ability to navigate the river in a snowstorm, I didn't spend too much time under the bridge, but climbed out and headed upstream about a mile, hiking through deep snow to another spot with more fish and calmer water that I thought might be productive. 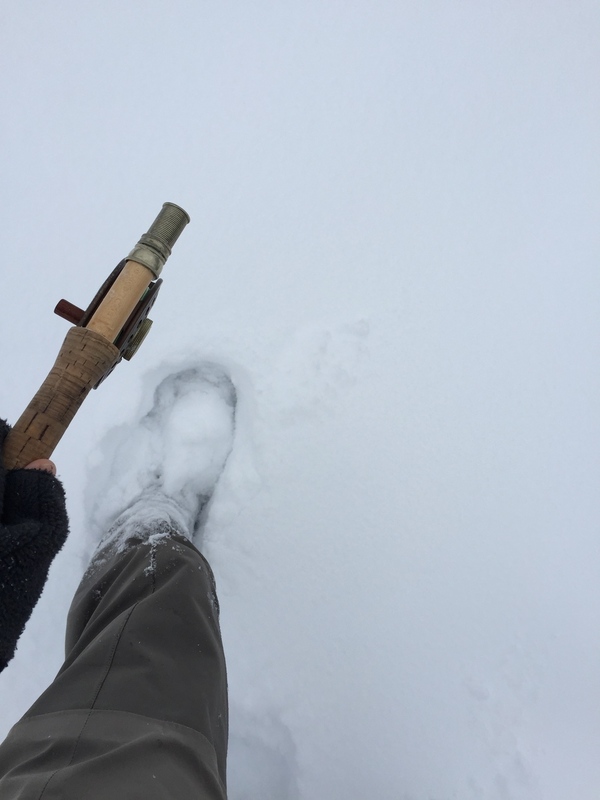 I was feeling less intimidated by the weather, and as I tromped through the drifts on the meadow, I again thought about how crazy what I was doing would seem to most people. Why go fishing in a snowstorm? Why not ski? Why stand around in the river when it's below freezing? I kind of enjoyed the thought, that this was completely nuts. But as I slid back down to the river, I realized that it didn't feel crazy at all. It felt completely normal. Obvious even. Why wouldn't I be here? I have the river all to myself. I know what I'm doing. It's quiet. I'm warm. The fish are hungry. 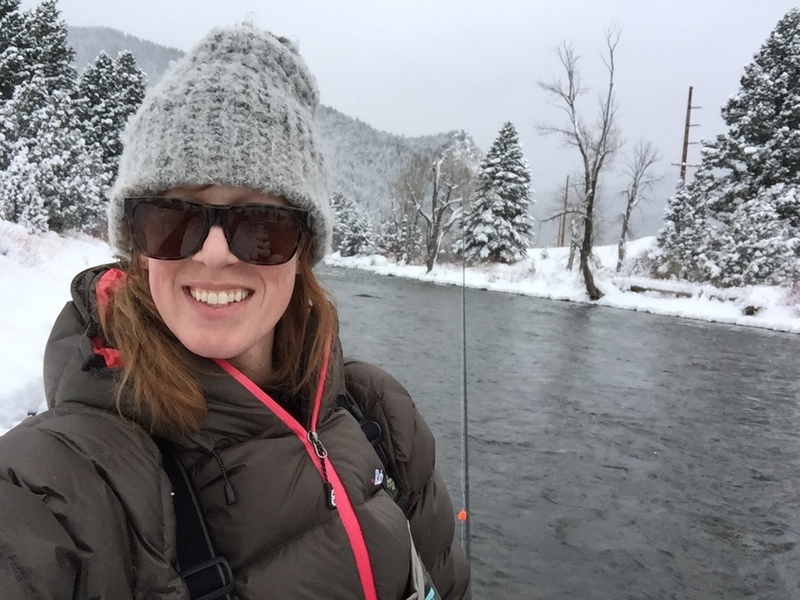 It's a perfect storm for someone who loves nothing more than the feeling of the water pressing against her legs, that first tug on the line as she sets, bringing a fish into the net and not having to maneuver around any assholes other anglers. The snow was beautiful. The cold was invigorating. The fishing was lights out. When I realized that I'd broken off the last of the flies that I brought, I happily stepped back onto the bank and began the trek back the car. I've learned that winter fishing demands both preparedness and minimalism if you're going to stay warm, dry and focused. Screwing up has a different sort of consequences now than it does when the sun is shining and it's 80 degrees. I'd brought just my net, rod, a spare leader, one spool of tippet and a small fly box that only held rubberlegs and prince nymphs, so I didn't have anything to collect that wasn't already attached to my person. I was free to examine the experience with few distractions. I was in my favorite place, doing my favorite thing. Where a week ago it had been 65 and sunny, it was now 19 degrees and snowing, but the feeling was the same. I was completely content and utterly at home and had learned something new about myself. I'd always thought that my approach had to be singular. I was either going to do what I know, try something new or not worry about it. I didn't realize that I could move fluidly between the three, and that ability - to adjust, to respond, to grow - at once both in and of the moment, that was the goal. In and out of the river. With lots of practice and zero expectations I am able to enjoy the things that I know, the thrill of learning something new and the contentment of just being there. I am able to move between the give and take and stay in the enjoyment of the moment, and that's the zen of the thing. I still go fishing to counter the time I spend inside and to test myself and possibly learn something - there's always a give and take - but, first and foremost, I'm there because I love the river. Whatever comes of it is a bonus, because the experience itself is the goal, regardless of the outcome. The magic happens whenever I make the time to be there.